There are numerous ways you can protect the watershed by implementing some measures to conserve water in and around your home. Evaluate the ways you use water in your home. Check your faucets to see if any are leaking. 3000 gallons of water per year can be wasted from a leaking faucet or showerhead. Fix or replace them. If the toilet is running, get it repaired since a leaking toilet can waste more than 182,500 gallons of water per year. When replacing fixtures and appliances (dishwashers and washing machines) look for the USEPA’s WaterSense logo. This logo meets USEPA’s requirements for optimal water savings. For more on the WaterSense Program please visit https://www.epa.gov/watersense. Using environmentally friendly products can help the watershed as well. These products have less toxic chemicals in their ingredients, which are not only safer for you, your family and pets, but also for fish, wildlife and the environment. Look for the Safer Choice Logo, which meets the USEPA’s criteria for safer cleaning products and please visit https://www.epa.gov/saferchoice to learn more. You can do a variety of things outdoors to help the watershed! Don’t overwater your lawn. It only needs about 1 inch of water per week. If you have a sprinkler system, consider installing a shut off device such as rain and moisture sensors so you only use the water that is needed. Make sure your system is not watering the drive, sidewalk or house, which is wasting water. Your lawn and plants will benefit most when you water early in the morning or in the evening when less evaporation occurs. The water will penetrate the soil providing the roots with nourishment. Using mulch around your garden beds helps to retain moisture in the soil. Consider using soaker hoses or drip irrigation systems which provides water where the plants need it the most, at their roots! Remember to use hose nozzles that can be shut off and turn the hose off when not in use. Don’t over fertilize. Use only what you need by testing your soil. Too much fertilizer doesn’t help your plants and is bad for the watershed when rains wash excess nutrients from your yard into our streams causing algal blooms. New Jersey has a fertilizer law that establishes a time frame when you can apply fertilizers to your lawn. To learn more about soil testing and the fertilizer law please visit Rutgers New Jersey Agricultural Experiment Station at http://njaes.rutgers.edu/garden/. Better Yet, Go Native! Native plants have adapted to the conditions of the local region and need less water and fertilizer. Once established, native plants encourage pollinators and beneficial insects to your yard as well as wildlife. These critters help increase food production and aid in pest control. Make sure your plants are located in an area of your yard that benefits them most. Don’t plant a shade loving plant in full sun or a plant that likes dry conditions in a wet area. A native landscape saves you money and helps the watershed by eliminating the need for fertilizers and pesticides, and it’s easier to maintain. To learn more about native species and how to landscape your yard for your region visit the Jersey Friendly Yards website at http://www.jerseyyards.org/. Consider adding a rain garden or rain barrel to your yard. 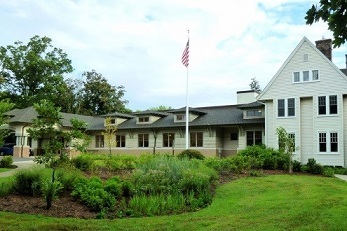 A rain garden is a beautiful addition to your landscape and it collects stormwater from your roof, drive and sidewalk, filtering out the nutrients and pollutants. It allows water to infiltrate into the ground keeping excess water from our streams and recharging our groundwater supplies. 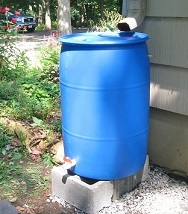 Rain barrels are placed under a downspout and collects water from your roof. By collecting this water, you can use it for your plants during times of drought as well as save money by having free water for the rest of the growing season. You are preventing excess water and pollutants from entering our streams, thus protecting the watershed. By making a few choices in saving water around you home and yard, you’re not only saving money and time; you are helping the watershed by preventing pollutants and excess water from entering our streams and waterways. You are also enhancing your home and neighborhood by creating a healthy environment for pollinators and wildlife. Thus preserving our watersheds for the future and creating a sustainable community.